Hitachi cylindrical stubs with standard (flat) tops. 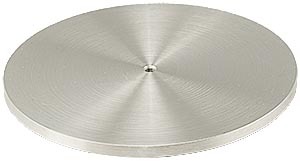 Hitachi dish cylinder stubs allow preparation of liquids directly onto the stub with the dish design preventing fluids from dripping from the stub. If you require an Hitachi M4 specimen stub which is not offered in the list below, please contact us. We can manufacture custom specimen stubs or often suggest a solution with alternative stubs. Hitachi 15 x 10mm diameter M4-type cylinder SEM specimen stub, aluminium. Packet of 10. Hitachi 15 x 10mm diameter M4-type cylinder SEM specimen stub, aluminium. Packet of 100. Hitachi 15 x 10mm diameter M4-type cylinder SEM specimen stub, aluminium. Packet of 50. Hitachi 25 x 6mm M4-type cylinder SEM specimen stub, aluminium. Packet of 10. Hitachi 25 x 6mm M4-type cylinder SEM specimen stub, aluminium. Packet of 100. Hitachi 25 x 6mm M4-type cylinder SEM specimen stub, aluminium. Packet of 50. Hitachi 25 x 10mm M4-type cylinder SEM specimen stub, aluminium. Packet of 10. Hitachi 25 x 10mm M4-type cylinder SEM specimen stub, aluminium. Packet of 100. Hitachi 25 x 10mm M4-type cylinder SEM specimen stub, aluminium. Packet of 50. Hitachi 32 x 6mm diameter M4-type cylinder SEM specimen stub, aluminium. Packet of 10. Hitachi 32 x 6mm diameter M4-type cylinder SEM specimen stub, aluminium. Packet of 5. Hitachi 32 x 6mm diameter M4-type cylinder SEM specimen stub, aluminium. Packet of 50. Hitachi 50 x 6mm M4-type cylinder SEM specimen stub, aluminium. One off. Hitachi 50 x 6mm M4-type cylinder SEM specimen stub, aluminium. Packet of 10. Hitachi 50 x 6mm M4-type cylinder SEM specimen stub, aluminium. Packet of 5. Hitachi 63 x 6mm M4-type cylinder SEM specimen stub, aluminium. One off. Hitachi 63 x 6mm M4-type cylinder SEM specimen stub, aluminium. Packet of 5. Hitachi 100 x 4.5mm M4-type cylinder SEM specimen stub, aluminium. One off. Hitachi 100 x 4.5mm M4-type cylinder SEM specimen stub, aluminium. Packet of 5. Hitachi 15 x 10mm diameter M4-type angled SEM specimen stub, 45 degree, aluminium. One off. Hitachi 15 x 10mm diameter M4-type angled SEM specimen stub, 45 degree, aluminium. Packet of 5. Hitachi 15 x 11mm diameter M4-type angled SEM specimen stub, with 45 and 90 degree angles, aluminium. One off. Hitachi 15 x 11mm diameter M4-type angled SEM specimen stub, with 45 and 90 degree angles, aluminium. Packet of 5. Hitachi 25 x 16mm M4-type angled SEM specimen stub, 45 degree, aluminium. One off. Hitachi 25 x 16mm M4-type angled SEM specimen stub, 45 degree, aluminium. Packet of 5. Hitachi 25 x 8mm M4-type angled SEM specimen stub, double 45/90 degree, aluminium. One off. Hitachi 25 x 8mm M4-type angled SEM specimen stub, double 45/90 degree, aluminium. Packet of 5. Hitachi 25 x 16mm M4-type angled SEM specimen stub, 45 and 90 degree, aluminium (each). Hitachi 25 x 16mm M4-type angled SEM specimen stub, 45 and 90 degree, aluminium. Packet of 5. Hitachi 25 x 16mm M4-type angled SEM specimen stub, with double 90 degree tilt, aluminium. One off. Hitachi 25 x 16mm M4-type angled SEM specimen stub, with double 90 degree tilt, aluminium. Packet of 5. Hitachi 32 x 12mm M4-type angled SEM specimen stub, 45 and 90 degree, aluminium. One off. Hitachi 32 x 12mm M4-type angled SEM specimen stub, 45 and 90 degree, aluminium. Packet of 5. Hitachi 32 x 12mm M4-type angled SEM specimen stub, with double 90 degree tilt, aluminium. One off. Hitachi 15 x 10mm diameter M4-type dish SEM specimen stub, aluminium. Packet of 10. Hitachi 15 x 10mm diameter M4-type dish SEM specimen stub, aluminium. Packet of 5. 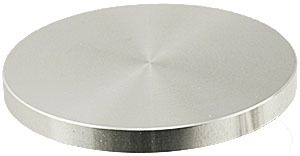 Hitachi 15 x 10mm diameter M4-type dish SEM specimen stub, aluminium. Packet of 50. Hitachi 25 x 13.5mm M6-type stem pin SEM specimen stub with thread, aluminium. Packet of 10. Hitachi 25 x 13.5mm M6-type stem pin SEM specimen stub with thread, aluminium. Packet of 5. Hitachi 25 x 13.5mm M6-type stem pin SEM specimen stub with thread, aluminium. Packet of 50. In-lens SEM specimen mount type-1 for Hitachi SU9000, S-5500, S-5200 and S-5000 SEMs. One off. In-lens SEM specimen mount type-2 for Hitachi SU9000, S-5500, S-5200 and S-5000 SEMs. One off. In-lens SEM specimen mount type-3 for Hitachi SU9000, S-5500, S-5200 and S-5000 SEMs. One off. In-lens SEM specimen mount type-4 for Hitachi SU9000, S-5500, S-5200 and S-5000 SEMs. One off.